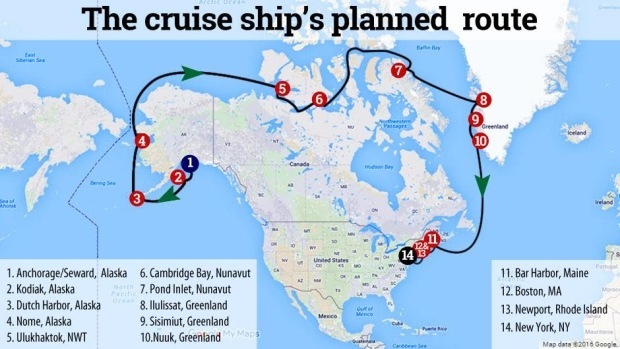 SOURCE CBC – As a large cruise ship gets ready to sail the Northwest Passage this summer, there are safety concerns about how prepared the Canadian Coast Guard would be should something go wrong. The mammoth Crystal Serenity cruise ship will make its inaugural voyage through the waters in August, with about 1,000 passengers and more than 600 crew on board. It is the first of the world’s big cruise companies to try something like this. Warming temperatures and a shrinking ice pack have opened up enough of the Northwest Passage for some shipping and large-scale cruising. But it remains one of the most remote and least mapped regions in the world — it is largely out of reach for Canada’s search-and-rescue helicopters. That has some concerned. Michael Byers, a Canada research chair in global politics and international law at the University of British Columbia, says the Canadian Coast Guard is not properly equipped to handle a disaster in the area. “If the entire ship — all 1,000 passengers, all 600 crew — require search and rescue, for instance, if the ship sinks, then that would actually break the Canadian search-and-rescue system,” he told CBC News. What do you mean “stress”?